Icelandic Met Office announced that this morning that the glacier flood from Mýrdalsjökull glacier is now over. No earthquakes have been detected in Katla volcano during the last 12 hours. Conductivity is now going back to normal levels. 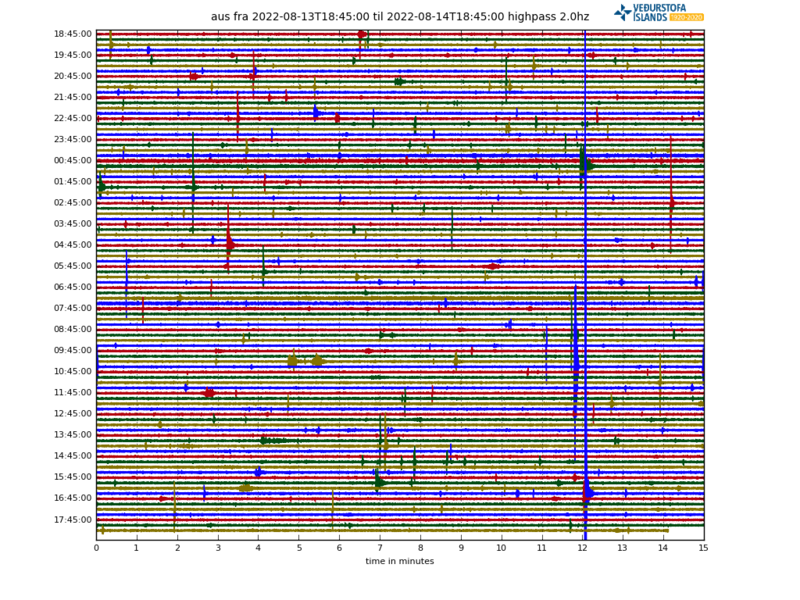 Earthquake activity in Katla volcano during the last 48 hours. Copyright of this image belongs to Icelandic Met Office. Colour code level of Katla volcano remains at yellow level and won’t be changed to green until sometimes next week. While this glacier flood is over Katla volcano has shown that activity can start again without warning. For now Katla volcano is quiet and no glacier flood happening. How is possible this enormous change in a short time? Iceland is very interesting really. I hope I don’t post this double. I am having some troubles with the Captcha lately. But I keep seeing little spikes in the tremor, although the weather seems fine. And yet no earthquakes… Is this just background noise Jón? The spikes are mostly normal. I am my self seeing slightly thicker events that suggests some type of pulse activity happening. Can you describe the problems with captcha? I don’t think it is anything on my side that is resulting in this issue. What thicker events do you mean Jón? Can you see that in the tremor? Thanks! I am afraid my website is not mobile or iPad friendly. I am searching for a solution that doesn’t involve a lot of change to my website layout. I have not found it. Thicker evens in the tremor are slightly lower and longer spikes that appear sometimes on the tremor plot. I don’t know if that was human made noise or something happening in Katla volcano. 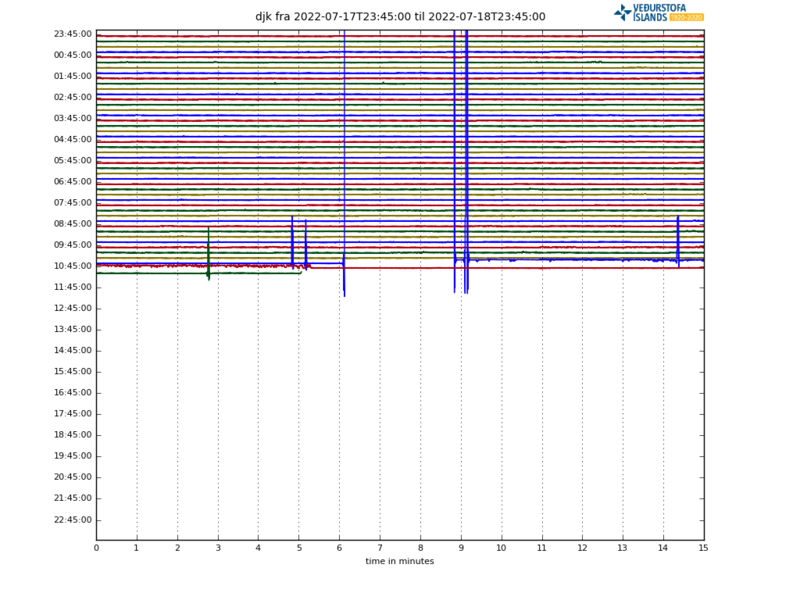 Alftagrof (ALF) – plus some more Myrdalsjökull stations – show low tremor-like activity during the day and is still going. There seems to have been practically no wind today. Mostly stations in the western parts of iceland are showing a sharp increase on the low frequency. Just background noise. What you are looking for is activity as it appeared on 29-July-2017. Anything else is just background noise or some random pattern that doesn’t matter (or just some changes in the hydrothermal activity in Katla volcano). What stations are you referring to? I can’t see anything special, apart from the stuff I wrote about Alftagrof. That event yesterday at Alf looks interesting. In general, those small pulse-like things seem to have started to happen here and there. Subtle, but still another novelty. On some stations the pulses are clearer, but something is visible in each station’s (Aus, God, Sly, Hvo, Alf) highpass graph. What could this be? In other news, conductivity in Múlakvisl has started to rise again though it’s still under 200. Otherwise, everything seems quiet. Interesting. Massive quakes rock BB. 3.4, 3.8 and 4.4 in swift succession. Time for a new article Jón, immediately! Is there a web cam for BB these days? I don’t think so. It is expensive to run hardware like that at this remote location. Is there a web cam on BB these days? Bárðarbunga is playing catch up after its recent step away from the limelight. Start incoming! It is unusual to see the earthquake where the magnitude 3,0 earthquake took place. I’m not sure if depth of 49,5 km is correct. If that is correct depth, that is a new level of depth. Iceland Met Office has updated that earthquake to magnitude 4,5 at depth of 49,1 km. It was also wrong. It has been changed to depth of 0,2 km with magnitude of 4,2. Now at 0,9 kms 4,2 at Bardarbunga. That seems more like it. That earthquake has poor quality. So depth is not accurate. Sorry for the lack of update. I’ve had a busy day outside of writing and then I got a headache and what seems to be a problem with my memory today (I forgot things far too easy and a lot faster than is normal). I hope to have an article on Bárðarbunga volcano in few hours. There is a slight tremor change taking place in Katla volcano. I don’t know yet if that is anything to worry about.